Towards the end of summer I saw this gorgeous flower wall on Instagram. I then started to figure out how I could do one for above Aria's crib. I gathered all my materials, got a good start on it, and then something came up and I set the project aside to be finished at a later time. Well.... After it was set aside I had to obviously hide it from the boys. I did a really really good job hiding it from them. Because now I can't find it anywhere!! In a crazy nesting frenzy I stuck the basket somewhere and now I can't remember where! I'm so bummed. Hopefully it turns up soon and I can finish it. In the mean time I have the break down of how to make your own flower wall. In my initial test runs I made a small one that hangs by the laundry room. Essentially this is what I was going for... And when I find it, it will look similar to this above Aria's crib. ~Floral wire cutters (These are if you decide to use more expensive flowers that need to be cut from the stem). 1) Cut a random length of hemp. I wanted my rows of flowers to be all different lengths. You can make yours even if you'd like. I just like the depth it created when the rows were random sizes. 2) Pull the flowers off of the stems. The flowers from the dollar store pop off really easily. However, if you spring for more expensive flowers, you may need to cut them from the stem. Which is why you would need the wire cutters pictured up top. 3) Taking the end of the hemp, tie it around the base of the flower. I had originally tried stringing the hemp through the center of the flower. It worked but I wasn't happy with how the flower then would lay against a wall. 4) Then add more flowers! I used different kinds and purposely did not space them evenly or form a pattern. My hope was that the rows would in "fit together" that way. 5) Tie the hemp to a wooden craft stick. 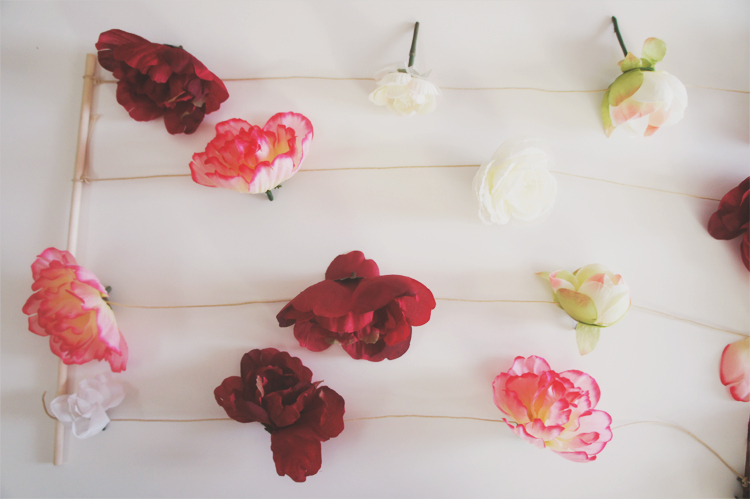 Once you've completed a row of flowers you can start to assemble your wall. 6) Fill as many craft sticks with flowers as you like! Aria's wall was going to have four sticks, each with four rows of flowers. 7) Hang them up! I measured up two nails on the wall not quite at the end of the craft sticks. Then I simply set the stick on top of the two nails. And that's it! Hopefully I will find Aria's flower wall soon so I can finish it. Then once it's hanging I'll post it up. I found this craft to be pretty simple and it didn't eat up too much time. You can make these for around the house, for party decorations or even as a back drop for a fun photo booth. Let me know if you give it a try!